The poster above contains essential information about the November commemorative ‘Gathering’ in Williamstown this year. Wouldn’t it be good to see an Outreach programme associated with this Standing Rock in memory of the young Irish Famine women who arrived in Port Phillip? Organisers and descendants could choose the kind of outreach they would like. What do you think? I’m sure Dr Noone would encourage any proposal. To return to some of the issues raised in my last post. Most of us will agree that the Earl Grey orphans had psychological baggage when they came to Australia. Some of them from places such as Skibbereen or Dingle or Kilrush may have been damaged more than others, making it hard for them to cope with the troubles they met in their new home. “To be uprooted from your home country by force of circumstance, whether it be persecution or the prospect of starvation, and transported to a strange and foreign land can be a deeply traumatic experience. The fact that the refugee is thereby enabled to survive is unarguably a good thing. But that obvious benefit does not eliminate the emotional damage which the forced displacement causes”. Reading his oration again I’m aware how much I’m indebted to him in these two blogposts on “Skibbereen and beyond”. But let me play the devil’s advocate. What counter arguments or qualifications might be made to the claim that orphans from the Skibbereen area were especially vulnerable? Was Skibbereen so exceptional? Some qualifications to the claim have appeared already viz. there are places other than Skibbereen just as badly affected by the Famine. Dingle and Clare Abbey were mentioned in the previous post, for example. Note too the cover picture of the last post which features Captain Arthur Kennedy’s young daughter distributing clothing to children at Kilrush. “These helpless creatures are not only unhoused, but often driven off the land, no one remaining on the lands being allowed to lodge or harbour them. Or they, perhaps linger about the spot, and frame some temporary shelter out of the materials of their old homes against a broken wall, or behind a ditch or fence, or in a bog-hole (scalps as they are called), places totally unfit for human habitations, or they crowd into some of the few neighbouring cabins still left standing, when called to do so, as lodgers, where such numbers congregate that disease, together with the privations of other kinds which they endure, before long carry them off. As soon as one horde of houseless and all but naked paupers are dead, or provided for in the workhouse, another wholescale eviction doubles the number, who in their turn pass through the same ordeal of wandering from house to house, or burrowing in bogs or behind ditches, till broken down by privation and exposure to the elements, they seek the workhouse, or die by the roadside”. Or to take a different tack, there were another eighteen or so orphans from Skibbereen on board the Eliza Caroline and another eighty-five (85) on board the Elgin to South Australia about whom we know little or nothing. We just do not know how they fared in Australia. And therefore surely cannot be certain their Famine experience predisposed them to disaster in Australia. Remember too that the orphans did not board ship carrying disease or wearing lice infected rags. They had an outfit, a wooden box, a Bible, and would be well fed during their voyage to Australia. My thanks to Síle Ní Muirchú (O’Driscoll) whose spiritual home is the beautiful Gougane Barra in West Cork. Síle provided the following excerpts from the Dunmanway Board of Guardian Minute Books. Dunmanway is just up the road from Skibbereen. Fifteen orphans from Dunmanway were also on board the Eliza Caroline. “The clerk was directed to advertise for contractors to supply gingham. Contracts to be made on the 8th inst. “Letter from the Commissioners of 6th Inst No. 76770 containing instructions respecting Female emigrants – directions were given to the union officers to carry out the instructions of the Commissioners. Special Business “Tender for supply of gingham deferred for consideration”. “The clerk was directed to advertise for persons willing to convey to Cork 15 female emigrants with their boxes etc? – tender to be considered on the 15th inst”. Special Business “Tenders for conveying female emigrants to Cork deferred for a few days”. “The tender of Mr Ralph Phipps? To paint boxes for the female emigrants at 5/2d each was accepted”. “Debit Workhouse Invoice Account, and Credit Treasure, with the several sums as above”. “That all? The clothing and requirements/requisites? Required for the outfit of the Female emigrants are now complete”. Bibles, bonnets, boxes, shoes, and dressed in gingham, the Dunmanway orphans were privileged indeed, and cut a fine bib as they made their way to Cork en route to Plymouth and thence Port Phillip. I doubt that today many Syrian children seeking refuge in Lebanon or Jordan, or in Canada or Germany are receiving professional counselling. Nor are the Rohingya fleeing to Bangladesh. How far have we failed to come? Such psychiatric help did not exist for our Famine orphans either. Yet maybe 235 Earl Grey orphans living close to one another on board the recently built, well appointed but small, Eliza Caroline, fostered memories of home. Living cheek by jowl for a ninety day voyage provided plenty of opportunity to share and talk about past experiences, and about anxieties, and hopes, and dreams. Good medicine in itself, for some at least, was it not? There are different and subtle hues to our picture of ‘Skibbereen and beyond’, are there not? What tipped a vulnerable orphan into the abyss? What things made her life so difficult in Australia? Maybe the life cycle of an ‘at risk’ orphan became a disaster because of events that happened in Australia. How many of them fall into this category? It is hard to know. We may never know. My gut reaction would be, about ten percent (10%) of the whole. But if we include any Earl Grey orphan who went into an institution, even once, to a Benevolent Asylum, a Lying-in hospital, a women’s prison, a Mental Asylum, or whose children went to an Industrial school, I’d put the figure higher. We just do not know the history of all the orphans. Which is why the work of people such as Perry Mc Intyre, Karen Semken, Cheryl Mongan, Richard Reid, and committed family historians is so important to our understanding of this issue. Let me briefly explore, in general terms, the kind of thing that had an adverse effect on an orphan’s life. Here’s an incomplete list just off the top of my head. I hope you will identify others. Let me know your thoughts. I’ll just look at a couple of things from the list above. Under sexual and domestic abuse let’s include any orphan, vulnerable because of her servitude, who was a target for an employer abusing his or her power as master in the master-servant relationship. There will be more than the ones that came to court. Here are a few that were reported in the Melbourne press, the Argus. “The evidence went to prove that Mr.Williams (a schoolteacher of Brighton) had struck the girl repeatedly with a broom handle, and when she cried with pain he filled her mouth with ashes, to prevent the neighbours being alarmed”. Or in Catherine’s words,”he then knelt upon me and took two fists full of ashes and put them down my mouth”. “He pulled me out of bed and shoved me one way and then another. I was stupid and taken in labor after he beat me, and I can’t tell half what he did to me… The child was born dead. Prisoner struck me with his hand and his foot. He struck me all over. He struck me with the point of his foot. I was tumbling on the floor. My daughter was in the house when he beat me. He ill-used me from the Saturday till the Friday, when the child was born. Sometimes he’d up and give me a shove or a slap”. The sad thing is, a husband’s so-called “rights” to discipline and punish his wife and children was enshrined in law, a legal position which was underpinned by the ideology of most churches of the time. The head of a household, that is, the male, had a duty to administer ‘moderate’ correction to his wife and children to keep them on the straight and narrow. I wonder do we really live in more enlightened times. There are still plenty of troglodytes about. In the 1990s I did some research on Irish women in Mental asylums for my Irish Women in Colonial Australia. I am glad to say some excellent work has appeared since then, particularly by the former Professor of Irish studies at the University of Melbourne, Professor Elizabeth Malcolm. Have a look for Elizabeth Malcolm, “Mental Health and Migration: The case of the Irish, 1850s-1990s”, in Migration, Ethnicity and Mental Health…, ed. A. McCarthy & C. Coleborne, Routledge, 2012, and her chapter on Yarra Bend Asylum, “Irish Immigrants in a Colonial Asylum during the Australian Gold Rushes, 1848-69”, in Asylums, Mental Health Care and the Irish:1800-2010, ed. Pauline M. Prior, Irish Academic Press, 2012, 2017. One can gain access to substantial portions of these works by searching via Google books. Professor Malcolm identifies two orphans in her chapter on case histories in Yarra Bend, Bridget Ferry from Dunfanaghy in Donegal per Lady Kennaway, and Elizabeth Armstrong from Enniskillen per Diadem. One was described as a ‘congenital idiot’ and the other as suffering from ‘paralysis’ and ‘dementia’. But both were released ‘cured’ after only a few months stay in the institution. Professor Malcolm suggests they may have used the asylum for their own ends, “as a means of escaping from intolerable living conditions”. There was no shortage of Irish women in Australian mental hospitals. Dr Malcolm lists the reasons for their being there; post natal depression, grief at the death of children, alcoholism, head injuries and poor physical health, and some evidence of ‘gold fever’ i.e. overwhelming disappointment at not finding gold on the Victorian gold fields. “the mother states that during her pregnancy with this child she received the most cruel usage from her husband”. No matter how heavy the psychological baggage the orphans brought with them from a Famine ravaged Ireland, sometimes the struggle they had in their new home in Australia tipped them over the edge, and determined the downward course their lives. Woogaroo, later Goodna, now known as Wollston Park mental hospital in Queensland, built in 1865. Elsewhere in my blog I’ve drawn readers’ attention to the fact that because so many orphans married older men, in their old age they were more likely to spend their last days in an institution such as a Benevolent Asylum. Or as Dr Malcolm puts it, ‘elderly working class widows were especially vulnerable to psychiatric institutionalisation’. They coped as best they could, whatever way they could. Unfortunately records of the names of those in the Melbourne Benevolent Asylum have not survived. But they have done so elsewhere. One needs to be aware of the name of the ship and date of arrival to detect an Earl Grey orphan. Here are a few from the ‘Register of Personal details relating to persons admitted to Dunwich Benevolent Asylum’. (Queensland State Archives Ben 2/4). Dunwich is on Stradbroke Island in Moreton Bay. Mary Clark aged 69 admitted January 19th 1897. Born in Belfast, daughter of Charles Murray and Mary Donnelly…came to Australia 49 years ago by ship Roman Emperor, landed at Adelaide S.A. Goodness how far had she travelled. Eliza Dwyer aged 75 admitted May 4th 1898. Born in Belfast, daughter of John Frazer and Margaret Gallagher…came to Australia 50 years ago landed Moreton Bay. Eliza was one of the original Belfast girls who arrived by the Earl Grey. Ellen Agnes Hickson aged 61 admitted Oct. 29 1895 . Born Clare Ireland, daughter of John Leyden and Mary Cronin…came to Australia 1850 landed in Sydney…last two years in Asylum Goodna. Ellen Leydon from Ennistymon in County Clare arrived by the Thomas Arbuthnot. Eliza Scholes aged 52 admitted October 10th 1889. Born Belfast, daughter of Anthony Rodgers and Jane Harver…came to Brisbane ’48 & have been in Queensland ever since. Eliza was another of the original Belfast girls who arrived by the Earl Grey. It would be a major research project searching for, and cross referencing orphans in different institutions throughout Australia. Eliza Scholes nee Rogers had served three months for vagrancy in March 1888 and another 6 months for the same ‘crime’ in January 1889 in Toowoomba Women’s prison. A reminder, though, searching for orphans in such institutions, as I’ve said elsewhere, ” is merely adding the bias of expectations to the bias of the evidence itself”. But it is still worth doing. The work of family historians can act as a counterweight to this, even if they too have a bias of their own. Their concern is not with the ‘lost’ orphans. They are the survivors, and sometimes, maybe too often, view things through rose-tinted spectacles. As Noeline Kyle puts it in her very useful book, Writing Family History Made Very Easy, Allen & Unwin, 2007, in her chapter called “Nostalgia, Sentiment and Blazing Sunsets”, “we read about devoted wives, hardworking men, dear children and pious wives” (p.165). Noeline has important and valuable advice for all would-be genealogists and family historians. My intention was to include some Port Phillip orphan stories via family reconstitutions in this post, on the occasion of this year’s Williamstown commemoration. But the post is too long already. Next time, I promise, before the ‘gathering’ occurs. I hope it may be of use to the actors researching their roles for Jaki McCarrick’s play “Belfast Girls”. Break a leg! At the bottom of each blog post after the comments there is a search box. Type in whatever you are looking for and click enter and you will find what reference there is, if any, in the whole of the blog. Thus if you enter “Ellen Leydon” you will be told she appears in posts 51, 25, 9, and 4. Happy hunting. This entry was tagged "Belfast Girls", Alice Ball, Bridget ferry, Captain Arthur Kennedy, Catherine Mackie, Clare, Cork, Demography, domestic violence, Dr J. Kildea, Dr Jeff Kildea, Dunfanaghy, Dunmanway Board of Guradians Minute Book, Dunwich Benevolent Asylum, Earl Grey, Eliza Frazer, Eliza Ro(d)gers, Elizabeth Armstrong, Ellen Leydon, Enniskillen, Ennistymon, evictions, Jaki McCarrick, Kilrush, Lady Kennaway, Mary Coghlan, Mary Murray, Mental asylums, New Liverpool, Noeline Kyle, Professor Elizabeth Malcolm, Sarah Higg/Head, Skibbereen, Thomas Arbuthnot, Victoria, Williamstown, Woogaroo. Bookmark the permalink. Insightful and well written post again! Thanks Trevor. As always a thought-provoking post. My husband’s ancestor falls into the category of those who were/became damaged along the way…difficult to know which had the most impact, events before or after their migration. Or perhaps “simply” cumulative. Another great input to your book, you certainly make a great devil’s advocate. Thank you for another evocative and thought provoking post Trevor. Outreach is an activity of providing services to any populations who might not otherwise have access to those services. A key component of outreach is that the groups providing it are not stationary, but mobile; in other words they are meeting those in need of outreach services at the locations where those in need are. 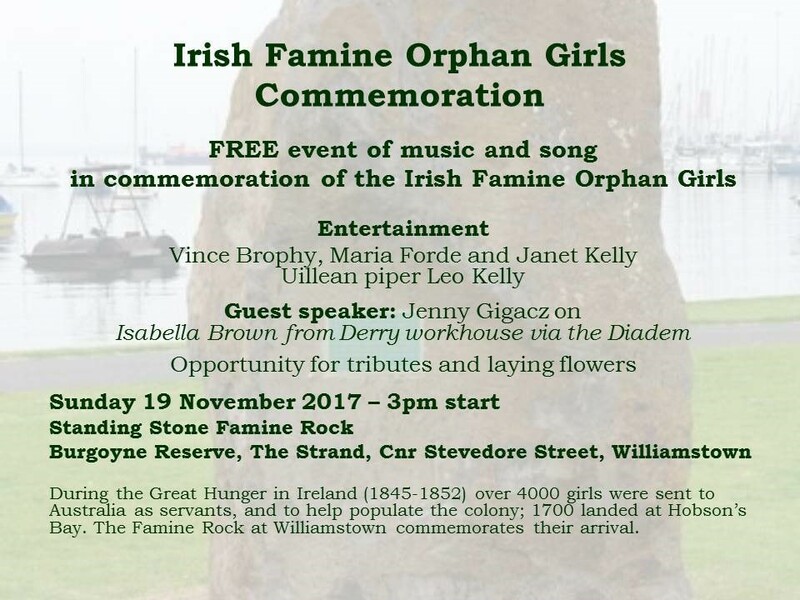 What do envisage when you ask – Wouldn’t it be good to see an Outreach programme associated with this Standing Rock in memory of the young Irish Famine women who arrived in Port Phillip? Organisers and descendants could choose the kind of outreach they would like. I helped set up the outreach programme associated with the Monument in Sydney. There were two things that we thought were appropriate, a fund for the Sisters of Mercy at Mamre who were helping women refugees from Sudan and Kenya. The other was establishing a prize for a student at western Sydney University, hoping that one day it may have enough to establish a scholarship. It was for a female student with a refugee background. I wouldn’t want to say what should be associated with the Port Phillip commemoration. I can think of a few things but maybe should be quiet. I’ll certainly give suggestions if asked. Thank you Trevor. As always very interesting. I am still trying to trace my Irish Orphan, Margaret Galvin (Late of Tipperary and Roscrea Workhouse) as far as her life after marrying the Ex-Convict from Tasmania. She raised 10 children. They lived mainly in the Mernda/ Morang district. Roscrea was also the place where Daisy Bates was born. The workhouse was apparently quite bad.